Giving up a lucrative career to start a business is always a risky move. 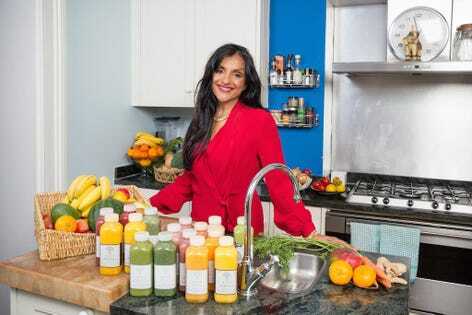 While most people feel compelled to follow their dream, others, like former corporate lawyer Geeta Sidhu-Robb who now runs health food business Nosh Detox, become entrepreneurs as a result of other factors in their lives. Launched a decade ago, UK-based Nosh Detox provides home delivery services of non-pasteurised juice diets and meal plans and has a client base that includes the likes of Madonna and Gwyneth Paltrow. However, Sidhu-Robb’s transition from legal professional to startup founder was neither planned nor straightforward. She was forced to give up her prestigious career when she got divorced and became the sole carer for her three young children. Having a critically ill son who suffered from severe food allergies, eczema, asthma and anaphylaxis as a baby made it impossible for her to be away from home as she spent the best part of a year in and out of hospital with him. In what little spare time she had Sidhu-Robb went back to studying, this time to learn about alternative health methods that might help her son. “Whether it was different therapies or nutrition techniques, I wanted to support my son outside of his time in hospital,” she says. While the doctors insisted it would be impossible to cure him using these methods, she was determined to prove them wrong. And she did. Using dietary solutions that she had developed herself she cured his eczema, reduced his asthma to an intermittent event, and saw his health radically improve. The catalyst was a comment that came from her best friend who she’d also devised a programme for to help her lose weight. “After four weeks and fantastic results, she told me that people would pay a lot of money for this kind of thing. That was the light bulb moment that became the start of Nosh Detox,” she says. With no support from her ex-husband and the loss of her corporate salary, financially, things were tough. And with no startup experience and no funding, in 2008 her only option was to secure a £2,000 ($2,600) overdraft from her bank and used it to set up her business. Because she had no real competition – no one was offering any similar types of product at that time – early sales took off quickly. But Sidhu-Robb admits that the lack of capital funding proved challenging as she tried to build the business. “When you bootstrap you grow more slowly than you otherwise would, but it also means you build foundations that are strong for later,” she says. Her limited finances meant she couldn’t afford any form of marketing activity, so her strategy for promoting her brand was to reach out to bloggers and influencers on an informal basis and offer them three-day food or juice trials. The strategy paid off when a number of celebrity clients started turning up. On the back of a successful crowd funding campaign that raised £150,000 she went on to open her own clinic premises, but in 2016 hit a setback that prompted a restructure in order to survive. It took the business most of 2017 to get back on track and the following year saw the launch of new product lines, online courses and coaching for high performing professionals. Two new clinics are also planned for 2019. Today the business employs 15 staff, and turns over just under £2 million.